IKA® process technology offers a vast spectrum of innovative solutions for numerous laboratory and industrial scale applications. From low to extreme high shear mixers, in-line mixers, batch mixers, colloid mills and turnkey systems. IKA® offers innovative and proven technology that is specifically designed for the unique requirements of the pharmaceutical & cosmetic industries. 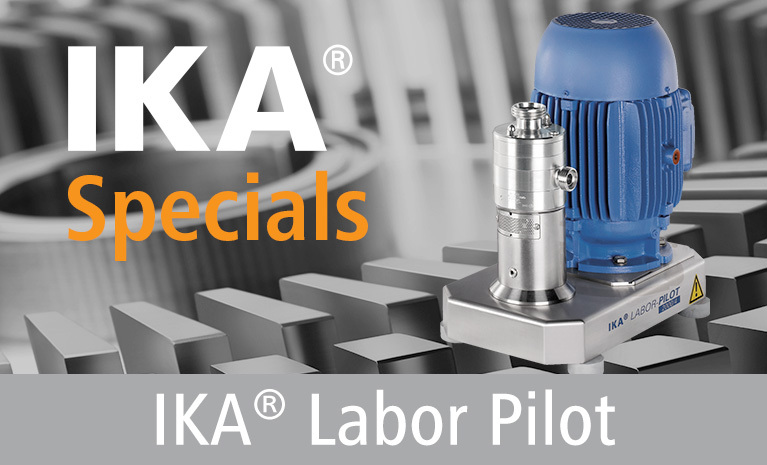 The IKA CMX 2000 is an inline mixer for rapid and homogeneous incorporation of powders into liquids. The circulation of fluid creates a powerful vacuum in the machine that draws in the powder. This ensures an agglomerate free integration of problematic powders that are not easily incorporated into the liquid phase. The multi-level design also enables a stable level of functionality even when working with high viscosities. Specific tools can be used to achieve the optimum dispersing quality. The magic PLANT is an ideal laboratory scale process plant. This system is used for batch mixing, homogenizing, emulsifying, and forming sample suspensions for capacities up to 2 liters. Whether it is involved with the manufacturing of liquids, pastes or powders – the magic PLANT delivers, enabling a seamless transition from product development to full production, a proven concept for selecting industrial mixers and mixing equipment. The CMX is commonly used in a recirculation process. An appropriate quantity of solids is incorporated into a fixed volume of liquid using the inline device. The CMX offers a simple, functional and cost-efficient method of incorporating solids into liquids, without the need for additional powder dosing systems or pumps. In a highly efficient inline process, small volumes of powder are dispersed into a highly turbulent area free of agglomerates. Watch the CMX Video here IKA introduces a unique approach to showcase the „Process Technology” product line with a creative marketing concept. IKA goes beyond traditional concepts and exploits the strength of combined content and graphics. The new SPP brochure has an elegant look with a refined concept, a catchy design, and a more detailed content. >> Watch more videos here!